I want to apologize for piquing your interest and then dropping the topic on these Amazon scrims. I haven’t had a chance to play League lately, and so a lot of my drive was just absent. I also apologize for the brief explanation of this first game. I don’t want to call people out because normally this blog only does that to strangers, but we had a couple key misplays early that cost us too heavily in the rest of the game. Amazon applied a lot of early pressure with the Hecarim pick, and it did work. We made sure they weren’t going to get that pick again. Also, I felt like Thresh was a key factor in their success, so we made sure to take that away from them. Going into game two we told ourselves that we would run poke. In Champion Select we actually baited the Vi pick. We left it up so that the enemy team could pick it. I felt like we got to counter pick ever role except for the ADC role. I picked Kog’Maw with first pick, and then let Amazon pick two champs. They picked up Miss Fortune and Vi. 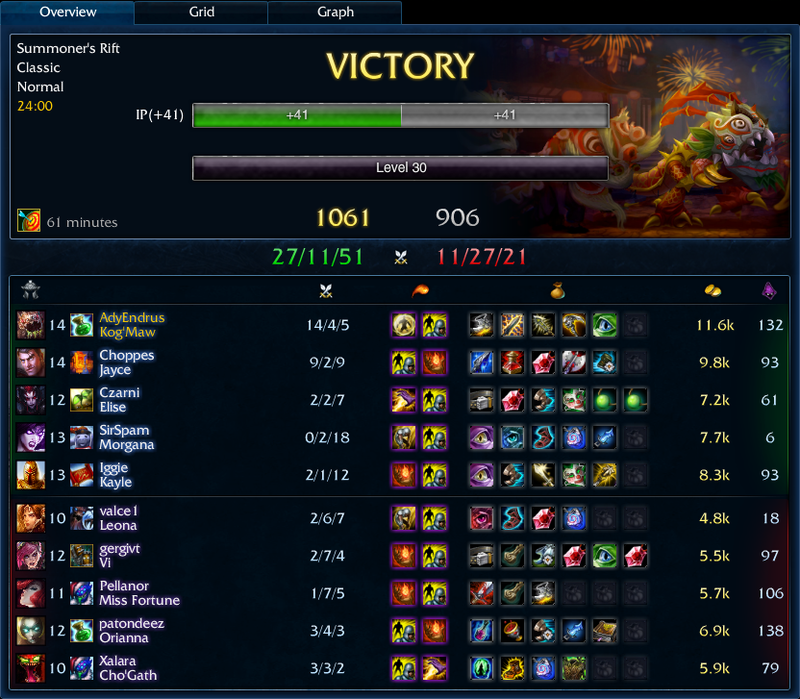 We had left Vi up, while banning out Amumu and Hecarim, so we assumed Vi would be their strongest jungle pick. We immediately countered with Morgana, who they assumed would go mid. Morgana does exceptionally well in our poke comp because of the disengage powers of her ultimate, snare, and spell shield. Also, she is the PERFECT counter to Vi because she nullifies Vi’s ultimate, giving her no ability to scale into the late game. It basically changes Vi’s ultimate so now she Blitz hooks herself into the middle of our team and doesn’t get to CC anyone. Laning phase opened strong for Morgana and myself because we had such an early Black Shield. I forgot to mention that it blocks all of Leona’s damage. It blocks her stuns, her extra passive damage, everything. It completely shuts down a support Leona in lane. It got to the point that Leona would go to engage on me, and without any of the CC from her abilities I would walk right through her towards Miss Fortune and MF would be forced to run away, leaving a poor Leona to die for her. Our mid game had a few hiccups, but was otherwise flawless. 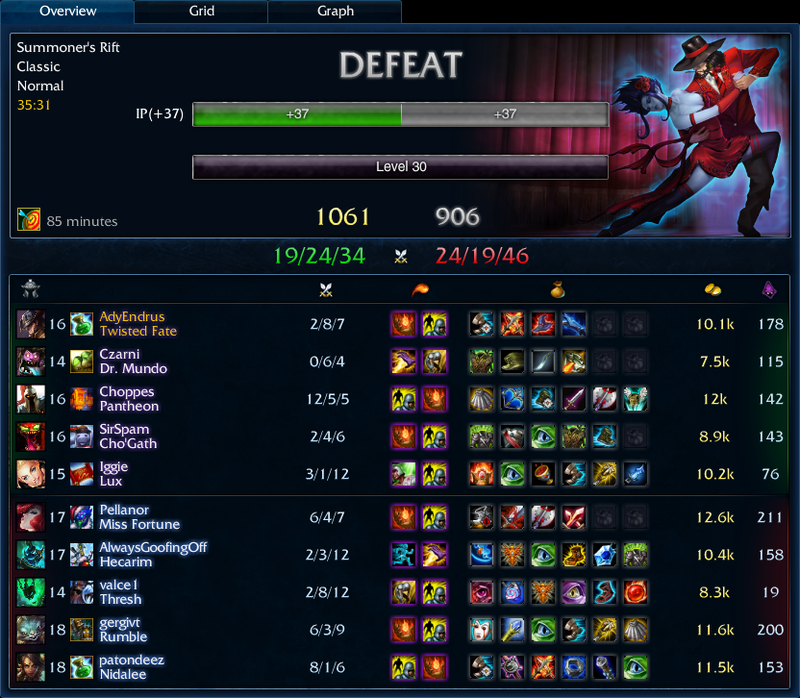 We grouped and started taking towers and the enemy team could do nothing but watch. To think that we destroyed their Nexus at 24 minutes is really an amazing feat. Also, feeding your ADC by taking free towers and picking up Dragons is such a bonus. With the amount of global gold we had it was like everyone on our team was fed. I can see why most teams will take a four minute tower in a side lane now. It really made us all so big. I felt really privileged this game to be the recipient of most of the spell shields and a focus for the Kayle ultimate. I felt like we were playing a real “protect the Kog” strat when really we just wanted ranged poke. It also was SUPER helpful that we had five ranged champs and two three melees! It had been awhile since I had acquired double the gold of the enemy ADC, but it felt wonderful to have it happen in this game. At the end of the game MF went to trade autos with me while he was standing between her two Nexus turrets. After two autos from me she Flashed back towards her fountain, but my third auto was already in the air and finished her off. I was only 12-4 at that point, I had to pick up two more kills on the fountain itself. This last game was for all the marbles. I was a bit nervous as they had bested us in the first game. We got pretty far behind in this third match up which really sucked as a Tristana player because Akali with a Kayle Intervention is enough to kill me. Luckily, while Akali was chasing me in the back of the team fight, Riven and Ryze were doing work on the rest of the enemy team. Ryze got real big this game. Close to the end of the game Iggie said “I just need a bit more gold for my Arch Angel’s staff” and I interjected and told him that Ryze doesn’t get that anymore, he only needs Manamune to upgrade to Muramana. Iggie didn’t fight it or question it, he just said, “Ok.” With that Muramana his damage was literally almost doubled. He started flipping out over how strong he had become after that one item. It was a game changer. 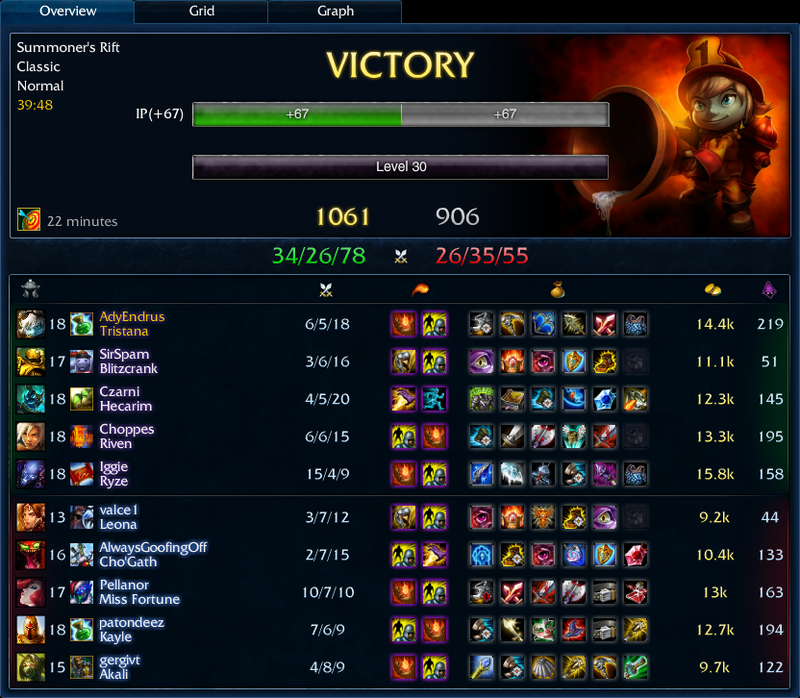 He picked up big team fight triple kills, which really helped us push this game over to our favor. We were down close to 5k gold, but brought it back to tie the kills at 26 to 26. From there we kept our late-game pressure as high as possible. Our whole team had immense late-game potential, with Ryze scaling as long as mana items exist, Tristana just gets longer range, one Blitz hook ends the game, Riven buying second lives, and Hecarim tipping the “unkillable” scale, we were a mean looking team to have to deal with.